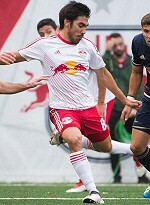 The Red Bulls II were denied the opening goal in the 38th minute when a turnover in the NCFC end came to Jared Stroud, whose shot was turned home at close range by Anatole Abang only for the finish to be ruled out for offside. A minute later, however, Jose Aguinaga picked out the bottom-left corner with a precise finish from 20 yards to put the hosts on top. Jared Stroud almost made it two for the Red Bulls II in first-half stoppage time as he fired just wide of the left post. 20 seconds into the second half, North Carolina leveled as Daniel Rios tucked home a close-range finish from Marcel Kandziora's low cross from the left. New York regained the lead in the 53rd minute after a clever passing move sent Lucas Stauffer into the left side of the penalty area to set up a low finish. Stroud again went close three minutes later as he cut past his defender in the left side of the penalty area but was denied by a diving save by NCFC goalkeeper Alex Tambakis. New York was reduced to 10 men with just over 20 minutes to go when Ben Mines was sent off following an off-the-ball incident, and with a man-advantage North Carolina pushed for an equalizer. New York goalkeeper Evan Louro pulled off a big diving save with a minute to go to keep out a header by Marios Lomis before Tiyi Shipalane sent the rebound over the crossbar, but Donovan Ewolo put home a close-range finish in the 90th minute to level the score.